Gunmen have kidnapped the deputy foreign minister of Libya’s internationally recognised government, the interior minister said. As sporadic factional fighting continued in several parts of the country, six people were killed when rockets hit residential houses in the city of Benghazi yesterday, medics said. The kidnapping of Hassan al-Saghir happened in the eastern city of Bayda – near where the officially recognised government has been based since being ousted from the capital in August. Gunmen snatched the deputy minister from his hotel, Interior Minister Omar al-Zanki said. Kidnappings have become frequent in the North African country, where two governments and parliaments, allied to different armed factions, are vying for legitimacy and control four years after Muammar Gaddafi was ousted. Abdullah al-Thinni, the internationally recognised Prime Minister and his Cabinet have been based in the east since a group called Libya Dawn seized Tripoli in August and reinstated the old assembly known as General National Congress. The struggle has been complicated by a separate battle between army forces allied to Thinni and Islamists in Benghazi, the country’s second largest city. 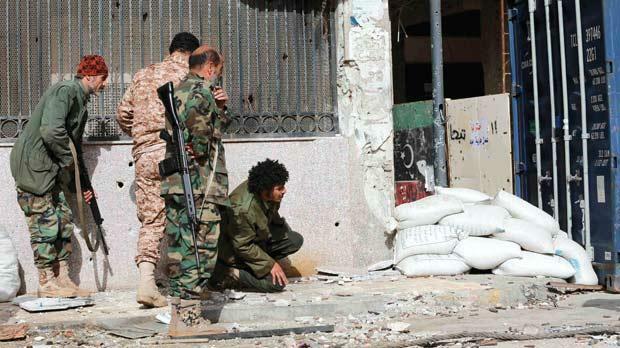 As well as the six dead, 20 people were wounded when rockets hit residential buildings in the al-Lithi district of Benghazi which the army has been surrounding for weeks to chase fighters of the Ansar al-Sharia Islamist group, medics and military officials aid. Salim al-Naili, a special forces battalion commander, accused Ansar al-Sharia of having fired the rockets. 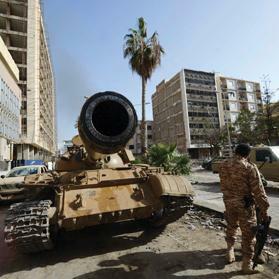 The army has merged its force with the troops of general Khalifa Haftar who declared in May his own war on Islamists. Members of the Libyan pro-government forces, backed by locals, take up positions during clashes with the Shura Council of Libyan Revolutionaries, an alliance of former anti-Gaddafi rebels, who have joined forces with Islamist group Ansar al-Sharia, near Benghazi port. The alliance now controls much of the port city but critics say Haftar’s use of war planes and helicopters has damaged many buildings and caused civilian casualties. Meanwhile, Libya’s Islamist militant group Ansar al-Sharia, accused by the US government of killing its ambassador to Libya in 2012, has confirmed the death of its leader Mohamed al-Zahawi, the SITE monitoring service said yesterday. Zahawi, whose Ansar al-Sharia brigade is listed as a terrorist organisation by the United States, died from wounds sustained in battle, members of his family told Reuters. Ansar al-Sharia is deeply embroiled in the violence and struggles for wealth and influence that have engulfed Libya since a 2011 uprising toppled Muammar Gaddafi. Its members have been battling the forces of former Libyan army general Khalifa Haftar since he declared war on the group in May, pushing it out of much of the Libya’s second-largest city Benghazi. The US government blames Ansar al-Sharia for an assault on a former diplomatic compound in the eastern city in 2012, which killed the US ambassador and three other Americans. In the video recording announcing Zahawi’s death, the militants swore revenge, according to SITE. “Know that the curses of the mujahideen will come successively upon you like thunderbolts,” a militant named Abu Khalid al-Madani said in the video released by the group on Jan. 24, according to SITE. It said Ansar al Sharia did not give any details of his death.